Founded in 1907 by two teenagers making retail deliveries, United Parcel Service (UPS) is now the world’s largest package delivery company, serving more than 220 countries and territories. Thanks to a global fleet of more than 110,000 vehicles and over 550 aircraft, UPS delivers 20 million packages and documents each day for 1.5 million shipping customers to 9 million delivery customers. Domestic Package (62% of revenue, 59% of operating profit): UPS is a leader in time-sensitive, small package delivery services in the U.S., offering a full spectrum of domestic guaranteed ground and air package transportation services. UPS delivers more ground packages in the U.S. than any other carrier, with average daily package volume of 14.1 million, most within one to three business days. International Package (20% of revenue, 30% of operating profit): UPS first expanded outside the U.S. more than 40 years ago. The company now offers a wide selection of guaranteed day and time-definite international shipping services across Europe, Asia, Canada, Latin America, the Middle East, and Africa. Europe accounts for about half of international revenue. Supply Chain & Freight Operations (18% of revenue, 11% of operating profit): UPS provides freight forwarding and logistics services to help businesses outsource these non-core activities to get their goods to the right place, at the right time, at a competitive cost. Increasingly complex supply chains are creating more demand for a global offering that handles transportation, distribution, and international trade and brokerage services. While the domestic business continues to generate the majority of revenue and operating profits, the company continues to expand overseas and diversify into supply chain & freight services. UPS's operating profit from U.S. operations has decreased from 88% of the total mix in 2000 to 59% in 2017, while international profits have quintupled their share of profits to 30%. Warren Buffett's Berkshire Hathaway and Bill Gates' Foundation Trust both own stakes in UPS, so it's no surprise that this business appears to have several enduring competitive advantages. Most notably, the global delivery service business is characterized by very high barriers to entry because few companies can afford to invest in all of the hard assets required to be a timely, reliable, and affordable operator in this space. Many companies will only reinvest 2% to 4% of their annual revenue in capital expenditures (capex), such as plant, property, and equipment. However, to build out and maintain its global delivery and logistics network, you can see that UPS's capex routinely exceeds 5% of sales. The company's capex spending as a percentage of sales was even in the double-digit range throughout part of the 1980's and 1990's as UPS built out one of the largest airlines in the world and expanded its global reach. UPS's capital expenditures have totaled more than $10 billion in just the last three years alone (plus another $2.6 billion spent on acquisitions), which has helped the company build a hard-to-replicate network of assets. Besides its global reach and well-known brand, UPS also makes the shipping process easy and convenient for consumers and businesses thanks to its 5,000 UPS Store locations, 39,000 drop boxes, and more than 27,500 UPS Access point locations. Given these demands, plus the many regulations delivery companies must comply with, it's no surprise that the U.S. market is largely dominated by UPS and FedEx today. However, UPS has the most extensive integrated global ground and air network in the industry. The company can provide virtually all types of package services (air, ground, international, commercial, residential, etc.) through a single pickup and delivery service network. Importantly, UPS gains a meaningful cost advantage as the world's largest package delivery company. As more customers use its network to move their goods around the globe, UPS can improve the utilization rates of its distribution centers, sorting hubs, airplanes, and delivery trucks. The cost UPS pays to fly one of its planes or send out a delivery truck on a route is largely fixed, regardless of how many packages are being carried. Handling more packages over time ultimately leads to denser delivery routes (i.e. fuller planes, trucks, and distribution centers), helping UPS spread its high fixed costs over a larger number of goods to lower its per unit costs and improve profitability. UPS has done a great job delivering more packages each year, with the company's 2017 average daily package volume rising 4.2% and 9.3% in the U.S. and in international markets, respectively. 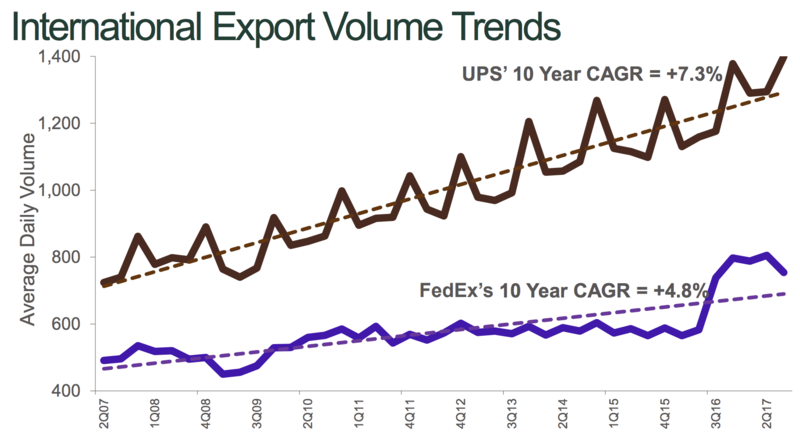 Looking longer term, UPS's international business has demonstrated particularly impressive volume growth, especially compared to rival FedEx. As a result of its leading scale and network efficiency, the company can provide global coverage to almost anywhere in 20 to 48 hours for a very reasonable rate. 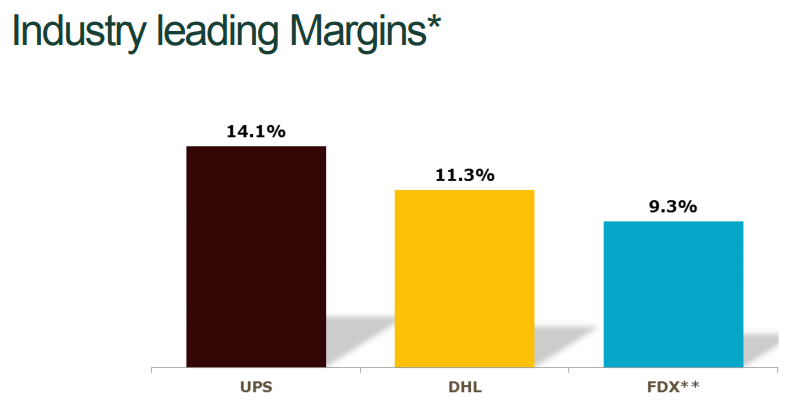 In fact, UPS's average revenue per piece was only $10.53 in 2017, providing customers with excellent value while still allowing the firm to generate industry leading margins. Part of the company's impressive profitability is also attributable to UPS's sharp focus on cost controls, including projects such as ORION, or On-Road Integration & Navigation, which utilizes route optimization to reduce delivery time, improve reliability, and cut fuel waste. 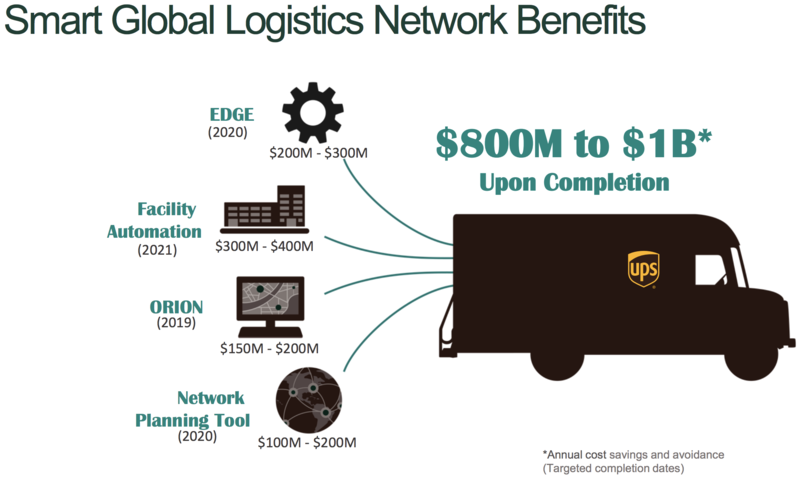 By continuing to invest in route optimization technologies and facility automation, UPS has consistently boosted the efficiency of its network. The company's ongoing investments are expected to generate $800 million to $1 billion in annual cost savings by 2021, representing more than 1% of annual sales. When combined with UPS's proven ability to deliver more and more packages each year, the company's primary competitive advantages (leading economies of scale, efficient transportation network, low per unit delivery costs) should continue to grow. UPS can also cross sell its supply chain & logistics services to many of its package delivery customers to help meet more of their total transportation needs. The continued rise of online retail provides an important long-term driver for UPS as well. As you can see below, cross border e-commerce spending in the U.S. is expected to grow approximately seven times faster than GDP through 2021, resulting in many more small packages that need to reach consumers' homes directly. Business-to-consumer shipments have risen from 36% of total U.S. domestic packages in 2009 to 48% last year, and that figure will likely continue climbing. This trend should benefit UPS thanks to its vast Access Point network, which makes "not at home" deliveries easy, and flexible UPS My Choice program, whose 40 million members can re-direct delivery times to fit their schedules. Overall, it's not hard to see why UPS appears to be a business that is built to last. Smaller rivals have a hard time replicating the company's convenience for customers, and their less efficient networks result in higher per unit costs on a global basis. As UPS continues taking more packages into its network, especially as e-commerce spending rises, its competitive position seems likely to strengthen. Importantly, the business has a very conservative and financially disciplined culture as well. UPS initiated an employee stock ownership tradition back in 1927 and is known for hiring its top executives from within its ranks. In addition to the company's investment grade credit rating, these factors have all enabled UPS to pay uninterrupted dividends since 1969. UPS is a very global business and is sensitive to economic conditions around the world. During recessions, consumer spending, industrial production, and retail activity usually fall significantly, resulting in fewer delivery volumes and greater pricing pressure. UPS maintains a healthy balance sheet and highly efficient operations to weather these difficult times, but investors should be aware that the company's results can be somewhat cyclical over the short term. The capital-intensive nature of the business can also create headaches any given year. Most recently, UPS disappointed investors when it announced plans to spend $7 billion in 2018 (up from around $5 billion in 2017) to improve its delivery network. The company struggled to keep up with the surge in holiday shipping volumes (a good problem to have over the long term), which ended up weighing on its profitability as it had to rent more expensive transportation assets to meet demand. Buying more than a dozen airplanes, expanding the availability of its Saturday delivery service, and automating more of its facilities and transportation network all require serious cash and weigh on short-term margins. However, these investments should further strengthen the company's global network, better positioning UPS to capitalize on rising e-commerce spending and worldwide trade while providing customers with the convenience, timely deliveries, and reasonable prices they have come to expect. While the rise in package volume is certainly a tailwind, it is also encouraging other players to enter the industry. DHL is one example. The international shipping company actually exited the U.S. delivery business in 2008, but the continued rise of online shopping has pulled its focus back to the region. Specifically, DHL plans to launch a delivery service for online retailers in Los Angeles, New York, and Chicago, with plans to expand to other metro areas such as Dallas, San Francisco, and Atlanta later this year. The economics of business-to-consumer deliveries are somewhat more complicated and costly than commercial deliveries because fewer packages are dropped off at each stop. When combined with the spike in holiday volumes UPS experienced, introducing a new rival in this part of the business could result in some pricing challenges. While DHL is certainly a notable rival, Amazon, a UPS customer, is the giant investors worry most about. In February 2018, The Wall Street Journal reported that Amazon was preparing to launch its own delivery service for businesses, starting with a pilot program with its third-party sellers in Los Angeles this year. Naturally, Amazon is expected to undercut UPS and FedEx on pricing. Amazon is certainly a force to be reckoned with, and cheap, quick delivery is obviously a critical aspect of the company's value proposition. However, outside of denser urban areas, it doesn't appear that Amazon has decided to back up the truck to invest in the transportation assets required to match the global scale and efficiency of UPS's network, which has been painstakingly assembled over the course of decades. The immense scope and growth of online retail delivery, combined with the sheer amount of time it would likely take to assemble a competitive global network, suggest that Amazon is unlikely to be an existential threat to UPS's business. However, investors will want to make sure that UPS stays on top of the situation. After all, if Amazon becomes a major rival to UPS and FedEx, or merely takes more of its deliveries in-house, that could dampen an important growth catalyst for UPS and hurt the company's long-term profitability. UPS represents a best-in-breed delivery company with a very shareholder-friendly management team, one that has rewarded investors with stable or higher dividends for nearly 50 consecutive years. The company's global scale, hard-to-replicate global transportation network, and continued investments in efficiency initiatives seem likely to keep UPS at the top of its industry and paying safe, growing dividends for many years to come. While high capital spending needs, potential threats from Amazon, and occasional global economic turbulence can weigh on the company's short-term stock performance at times, UPS's long-term outlook seems to remain favorable. With plenty of growth opportunities both domestically and overseas, especially with the continued rise of online retail, UPS appears to be a reasonable investment to consider for most well-diversified dividend growth portfolios.